Tim lived in his 16ft summer home on Great Barrier Island, NZ for four months straight. 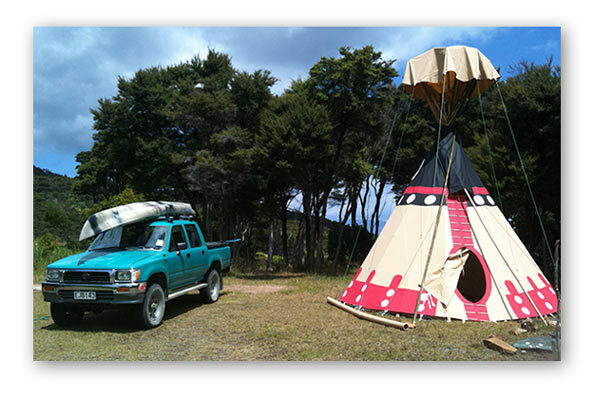 Every fall, we suddenly get a wave of inquiries from tipi enthusiasts in New Zealand and Australia. Your spring is in the air and it seems that more and more of us are being called to live close to nature or to have a hide-a-way where we can escape the modern world. We therefore decided to dedicate a page especially to you, in order to answer the most common questions that pertain to your countries. All prices are stated in US Dollars. Both New Zealand and Australia have a variety of climate zones and we recommend different fabrics for different uses. Unfortunately, there is a big ozone hole above most of your region, and the UV is pretty harsh. This will be the major factor affecting the lifespan of your tipi cover. If at all possible, choose a spot for your tipi that is shaded. Next, in parts of the country it is both hot and humid, and mold and mildew can develop rapidly. Although all our fabrics are treated with an anti-fungal solution, it only prevents mold and mildew for so long. As we have heard about extreme cases where mold developped within weeks in Australia, we now recommend that you treat your cover with a water repellent finish before you put it up. For a more suitable fabric for your climate, contact Rainbow Tipis in Byron Bay, NSW, Australia. Our 13oz Sunforger is lightweight, so it will dry quickly, and it is our experience that mold can be cleaned off easy. The lightweight material will not hold up as long as the heavier material if it is constantly exposed to direct sunlight with high UV radiation. Our 15oz All Weather Sunforger is a sturdy fabric designed for all year living, including cold winters. This fabric consist of 15oz of 100% cotton, so it will last longer than the 13oz. We believe that cotton holds up better against UV radiation than polyester blends. It is also easy to clean in case mold and mildew develop. We do not necessarily recommend the 13oz flame resistant fabric, unless you are obliged to have it due to fire regulations. Campgrounds in the US have to have this fabric. It has one extra chemical in the mix, so if you don’t have to have it, the 15oz All Weather Sunforger fabric is a better fabric for year around living. If you worry about a fire inside, you can always choose a flame resistant liner to feel more comfortable. We are getting more and more parents and grandparents searching for a durable and meaningful birthday, Christmas or Easter present for their kids. Although sending a kids’ tipi half way around the world does not make our tipi the most economic option, it certainly is a unique, authentic and one-of-a-kind gift for your little ones. 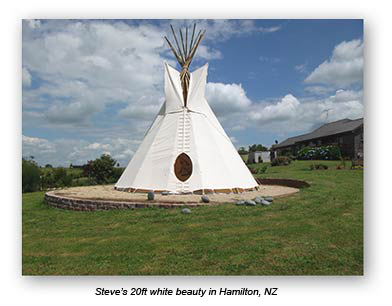 We can send the tipi plain for your kids to paint it, or with two buffalo skull shields sewn onto it. The kids tipi comes in a white 10oz flame resistant material, or, if you prefer, we can also make it out of the 13oz Sunforger in tan or white. 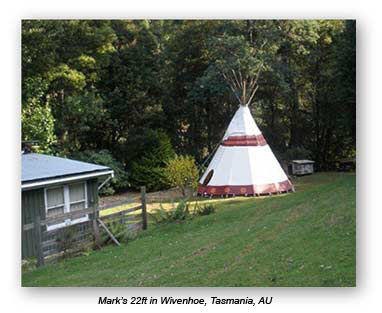 In both cases, the tipi without poles costs US$238, with poles it costs US$250. 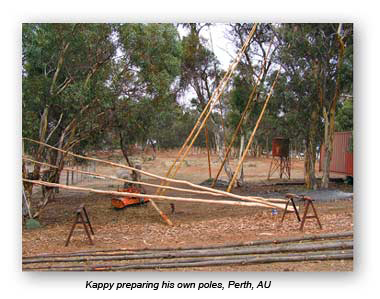 Shipping the tipi without poles costs US$95, with poles US$205 for both New Zealand and Australia. We suggest getting your own poles for the kids tipi, you will need 9 x 10ft and 2 x 8ft poles, and bamboo works well. Total cost incl. shipping without the poles is US$333, with poles it is US$455. 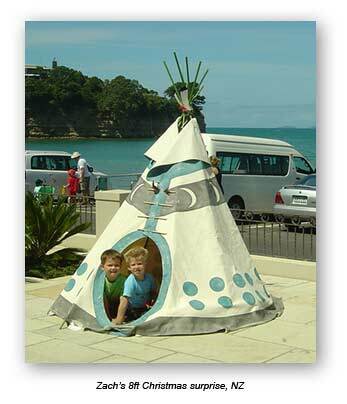 If you like your kids tipi to be custom painted, we will be happy to give you a cost estimate for the artwork. They sell tipis and poles separately. They also sell our tipis. To the left is a table that tells you exactly how many poles you need and how sturdy they need to be. We now have found a new way of shipping Fedex Economy directly to your home address. Most tipis will arrive in two packages, one of them will be 24”x20”x12” and the other will usually be 18”x18”x12”, unless you are getting the 22ft tipi size. Additional importation fees are mainly the GST and duty as percentage of the value of the package. Below you will find the total charges from us for your tipi package (cover, liner, door, ropes, pins, stakes, sack) and freight to your door, not including importation costs mentioned. The prices given are close estimates and reflect the total amount which we will bill you in US$. If you are ordering more than one tipi, freight prices go down, and we give quantity discounts up to 7%. 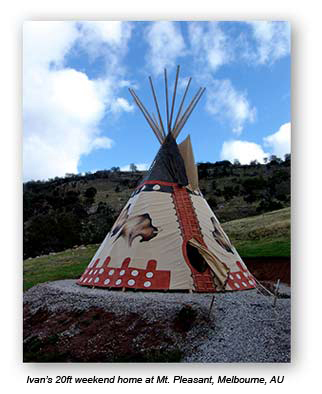 22ft tipi packages include a 9ft liner. When UPS delivers your packages, you might be charged importation fees. These charges are local and you will be billed in your local currency. New Zealand has a the time of writing 5% duty and 15% GST. In Australia, no GST is charged as long as the value of the package is under AU$1000. Please inquire about your duty rate locally, it seems to vary. If the invoice that we attach to your freight is above AU$1000 in merchandise, a 10% GST is charged as well as 3% import duty. Businesses however can reclaim the GST part on their B.A.S return if we quote your ABN on our invoice. Please indicate at the time of order if you have an ABN and we will put it on the invoice. The time between order and shipment can be 4 – 8 weeks. Shipping takes up to 10 business days. Once Fedex picks up the cartons, we will e-mail you the tracking number, so you can follow your tipi’s route to its new home. We look forward to hearing from you and assisting in growing the tipi community in your country.